This entry was written by Sarah Jenkins, posted on 04/20/2015 at 11:12 pm, filed under April 2015 category. We checked out of our hotel in Galilee, sad to leave this beautifully green region of Israel, but we were assured by Yuval, our guide, that “the best is yet to come”. We began our day with a rare treat as we climbed to the top of the Arbel cliffs above Tiberius. We could see the whole Sea of Galilee from this spot and a spectacular view of the lush valley below. Pastor Becton took the opportunity to encourage us to have a quiet time with the Lord each morning – even while in His Land – Jesus did! (Mark 1: 35). We need that spiritual B12 shot every day. God’s mercies are new every morning! We ended our time there by singing ‘Great is Thy Faithfulness’. Our journey took us past Mt. Tabor, army bases, water reservoirs, Mt. 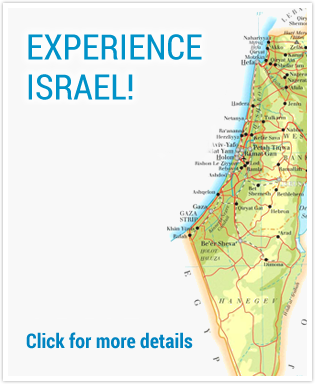 Gilboa, watermelon fields, and a free “hotel” (a prison!) as we travel down the Jordan valley to a city called Bet She’an. Bet She’an is strategically positioned in the Jordan Valley at the intersection of several ancient trade routes. It has been governed by a succession of rulers, including the Egyptians, Greeks, and Romans. The biblical reference to it can be found in 1 Samuel 31, which records the death of King Saul and his sons – their bodies were hung on the walls of this ancient city. Then, David’s lament, recorded in 2 Samuel 1, is where he grieves over the death of King Saul and his son, Jonathan, David’s very dear friend. The ruins here are incredible; when you see it you say to yourself – “we need more time”. You could easily spend a day here. If you want to get an idea of life in a big city in ancient times, this is one of the best examples on earth. It is impressive how sophisticated it all actually was. Bet She’an is a relativity new excavation. Destroyed by a severe earthquake in 749 C.E., the city was abandoned and covered over with trash and dirt for years. Major archaeological excavations have only been done in the past 30 years. After a short walk, we found a little cafe where we had falafel, schnitzel, etc – another good meal! After our meal, we boarded the bus for a stop at Bethabara, the site on the Jordan River where many historians believe Jesus was baptized. There were several groups there with one group singing worship songs. Back on the bus, we make our Aliyah or ‘going up’ to the Holy City of Jerusalem. Nothing can really prepare you for that first look at the Holy City. Its stirs something down deep in your soul and it brings many to tears. We got our first look from the window of the bus as we were driven up to Mount Scopus. We were anxious to get off the bus and walked to an overlook where we could really look at the city walls below. “This is it. 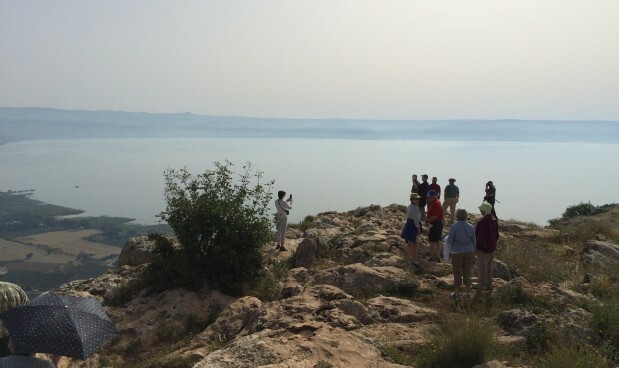 I’m really looking at it.” We gathered together on the overlook as Bill Reichert read a Davidic psalm of ascent, a prayer for Jerusalem. Pastor then prayed a special prayer for this land, especially the people. We slowly moved back to the bus as we did not want to leave this beautiful view of the Holy City. We finished our day with a stop at the Nissan Brothers Olive Wood Shop in East Jerusalem. Some of the most beautifully carved olive wood can be found here as well as many other treasures. It’s been a long but wonderful day.